1 Bob Costello Famous Sayings, Quotes and Quotation. 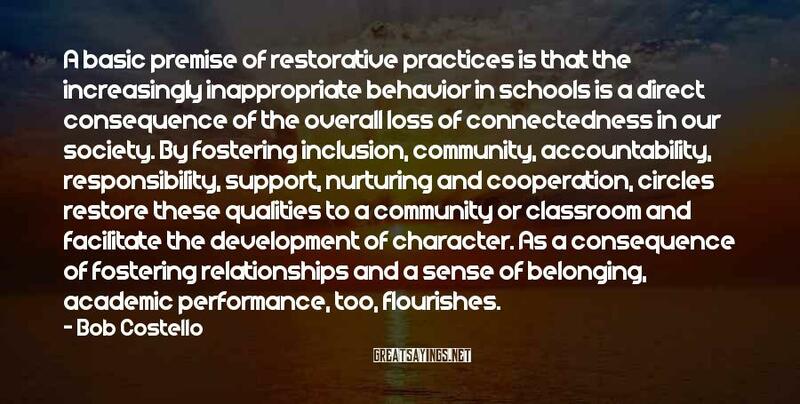 A basic premise of restorative practices is that the increasingly inappropriate behavior in schools is a direct consequence of the overall loss of connectedness in our society. By fostering inclusion, community, accountability, responsibility, support, nurturing and cooperation, circles restore these qualities to a community or classroom and facilitate the development of character. As a consequence of fostering relationships and a sense of belonging, academic performance, too, flourishes.